Today I’m pleased to have Katherine McIntyre on the blog. I’ve known Kat for a number of years now, and like me, she writes in different genres, and for all ages. The Take to the Skies series is a fun YA trilogy (PG-13 in content) which appeals to both teens and adults. If you enjoyed Stardust, Serenity, and Firefly, trust me; you’ll love this series. 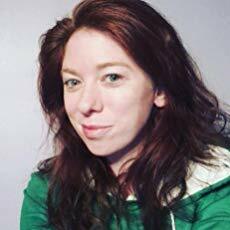 Kat is a very talented author who writes strong women, snarky men, and unforgettable adventures, and I jump at every opportunity to show readers her books. She’s seriously that good. 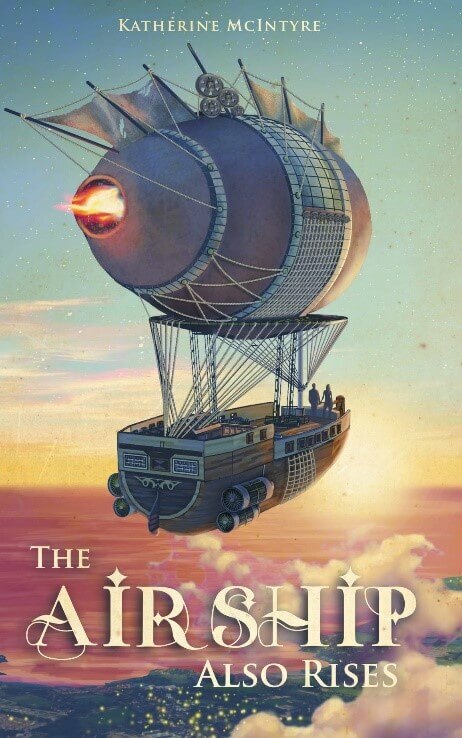 Enjoy, and be sure to check out The Airship Also Rises! Already, they were five minutes late. “When do we get to shoot something?” Sabine complained, her hand brushing over the piece at her side. Girl might whine now, but the couple of bounty drops she’d performed didn’t classify her as a pro. Cracking shots at a paper target was land and air different from trying to fight a living, breathing enemy. “I’m sure if you asked politely, they’ll come parading in for you to try,” I shot back, wishing for all the world I didn’t have to babysit. Somewhere up above, Captain Morris snickered at me—payback for all the sass and vinegar I doled his way when I was her age. Not like I hadn’t earned this tenfold. A rustling sound at the opposite end of the warehouse snared my attention. Mordecai blended into the shadows over there, but some more folks pushed the door open with a creak. They stepped in through the entrance, their silhouettes accented by the bright rays of a summer afternoon. Matilda was out and pointed their way before I sucked in another breath. “State your intentions, or we’ll be peeling your bodies off the floor,” I called out. A shot rang through the air, coming from beside me. My jaw twitched. Sabine stood with her pistol aimed and her finger on the trigger. Those manicured brows pulled together in fierce concentration. My blood boiled, and I near had a conniption on the spot. A thousand curses on girls with smart mouths and access to firepower. Five redcoat guards clattered onto the docks in our path, their coats so tacky and bright, I squinted. The moment they caught sight of us thundering in their direction, their pistols were out and ready. Ahead lay redcoats who wanted to clap us in irons. Behind lay uniformed thugs who tried to drill us so full of bullets we’d be spitting iron. Death waited in every direction. To the left, a shaded alley trailed down the side of the open-air bistro, all tan walls, dark brown accents, and wire-rimmed chairs. Folks looked up at us from their porcelain mugs. I swallowed, hard. Time to throw caution and common sense out the window. “Follow me,” I called. I whipped around to the left, bolting in the direction of the alley as fast as my legs could carry me. Needed to move farther, faster. One of the bistro tables lay square in my path. Couldn’t stop now. I vaulted onto the chair, then the lattice surface of the wrought iron table. The chair clattered to the ground as I launched off the table, the wind streaming through my hair. Coffee splashed to the ground, porcelain cracked, and patrons scrambled to get the hell out of my way. As I slammed onto the ground, my shins reverberated. I raced towards the alley, the clamor of footsteps behind me. Geoff and Isabella kept pace while Mordecai slipped past with those long legs of his. The thugs unloaded their weapons, the bark of their bullets sparking pandemonium and ending in shrill screams. I kicked the stray crates in the alley out of my way, the flimsy things splintering as they hit the wall. The alley emptied out onto another cross street leading to the docks. 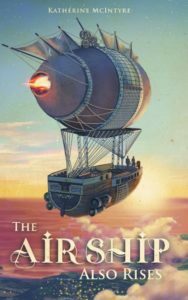 In the near distance, at least a dozen airships bobbed in the ocean, tethered to the mooring. My girl was among them.